Butler Mobility Products is a manufacturer of premium quality wheelchair Lifts and dumbwaiters. All of Butler Mobility's wheelchair lift and dumbwaiter products are rugged, sturdy units with UL® CSA certified components and are useful in commercial or residential applications. 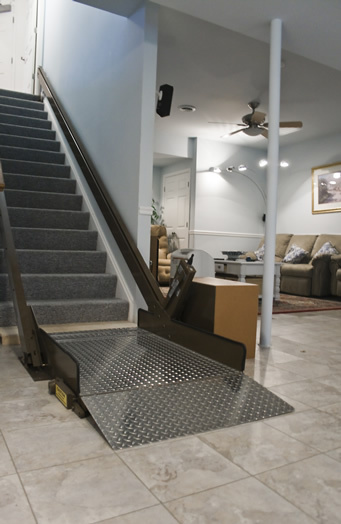 Butler Mobility Products has been manufacturing dumbwaiters since 1958 and wheelchair lifts since 1968. Butler Mobility Products are manufactured and assembled by Butler Dynamics, LLC in Lewisberry, Pennsylvania. 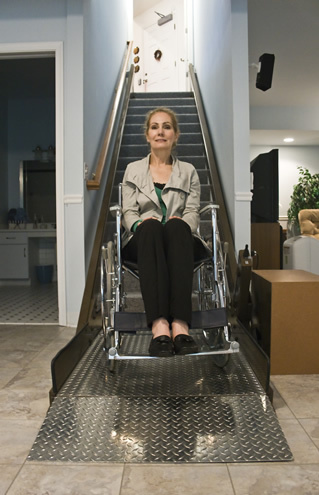 The Butler Mobility Inclined Plat-form Wheelchair Lift (IPL) is the perfect solution for a home with stairs where someone cannot transfer to a chair lift or needs to have a wheelchair on both levels of their home. Businesses, schools and churches can provide wheelchair access. Public and corporate buildings can have a safe and reliable solution. Our lifts meet or exceed all National Safety Code (ANSI/ASME code) requirements and have UL® and CSA certified components. 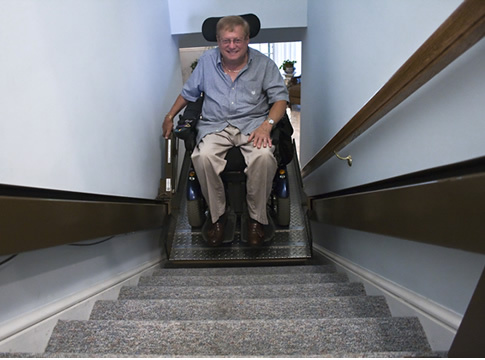 The Butler Mobility Inclined Plat-form Wheelchair Lift (IPL) is designed to fit your stairs and can accommodate turning stairways and intermediate landings. The Butler Mobility Inclined Plat-form Wheelchair Lift (IPL) is ideal for providing ADA compliant accessibility in heritage buildings, schools, churches and restaurants. With the availability of many colors and finishes, you can be sure that the wheelchair lift will blend in with the building's decor. The Butler Mobility Inclined Plat-form Wheelchair Lift (IPL Call stations are operated by a computer based lift control system that intuitively guides the user through the operating sequence by illuminating the appropriate button to push. Optional Fold and unfold functions are fully automated by simply pushing the easy to use call station buttons. The ultra-quiet Drive System is located at the upper end of the Artira and is available in two arrangements; the standard Drive Box and Compact Drive; both drive systems operate using Mains Power. The Butler Mobility Inclined Plat-form Wheelchair Lift (IPL) reduces the speed of travel by 50% prior to reaching corners and is programmed to slow the platform travel speed when approaching or departing the landings. Front-load platforms have 6" high safety guards on each side. CALL US TODAY OR EMAIL US!!!! We have installers and contractors ready to serve you!